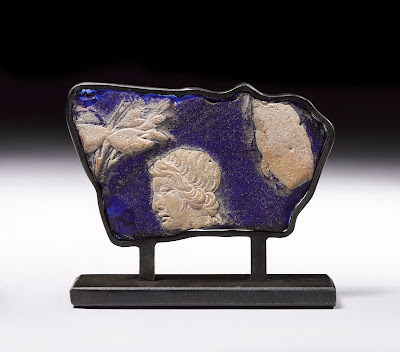 The Bomford Collection recently bought, with help from the Friends of Bristol Art Gallery and the Friends of Bristol Museums, Galleries & Archives, a beautiful piece of Roman cameo glass. Thank you for your support. The popularity of cameo glass developed and waned in the space of about 75 to 100 years in the first century. It is known from about 20 complete pieces and many fragments. We have no idea of the original size of this piece. The Dutuit Plaque in the Petit Palais, Paris, may be a close parallel: this is 210 x 190 mm, though made with three layers of glass rather than two. Two panels from Pompeii measure about 400 x 250 mm. Bristol was a centre for glass making in the 17th, 18th and early 19th centuries. It was partly to complement the ‘modern’ glass collection that Bristol bought the Bomford Collection of Ancient Glass, to show the long history of glass making in the Middle East and Europe. James Bomford collected over many years until the 1970s. His interest was at first just the delicate beauty of old objects that had survived for so long. He then became more interested in the subject, and started building ‘a representative collection of the many different techniques employed in those very early times … so that the collection would be a faithful history of the Ancient Art of Glass Making’. Bomford collected 175 glass objects or groups of objects. The collection ranges from a Mesopotamian piece from about 1500 BC, to a German piece from the 4th century AD. The majority of the collection reflects three main techniques, core-forming, free-blowing and mould-blowing, with a few pieces of fused mosaic glass and cast glass. Within these broad techniques, the collection shows different ways of making or finishing including grinding, engraving, polishing and painting. There are six small cameo amulets in the collection, with a profile or front-facing head on dark coloured glass, but they are very small, and damaged or discoloured, and do not show the cameo cutting technique well. Since acquiring the collection in the 1970s (by purchase, including private sponsorship, V&A Purchase Grant Fund support and Art Fund support) Bristol has built on the collection made by Bomford, acquiring pieces that represent types or techniques not already in the collection, keeping Bomford’s criteria in mind, that the collection should be a work of art in itself, that would both educate and entertain visitors. This cameo fragment is large enough to see the technique used to make it, and the skill of the cutter in sculpting the face of the young man. It references the relatively short-lived cameo technique as used to show scenes on large mouth-blown vessels and on cast inlay plaques, rather than single heads on cameo amulets. As a small, broken fragment, this cameo glass has no particular significance in itself: but it represents a fashionable, luxury craft and trade that would have been highly valued by its owner, and it fills a large gap in the collection. Sue Giles for The Bomford Collection.